Mobile app. * iphone/ipad. AR wearables. “Can’t Afford the Pain” brings performance and augmented reality together as collaborative duo ab:nb team up with alt-drag diva Ladonna Rama to produce a one of a kind interactive augmented video clip for the mid 21st Century. Taking on a retro-future fashion aesthetic Ladonna Rama performs the moody classic from her second album augmented by an evolving narrative that will reveal some of the secrets of the Ladonna Rama origin story. Premiering at Vivid Sydney 2018, with further performance dates to be announced. If you can’t make it, Ladonna Rama also offers an AR tabletop dance. *This app is only available on the App Store for iOS devices. 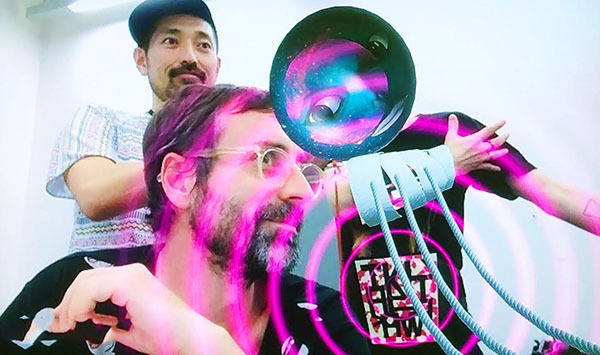 are Andrew Burrell and Nori Beppu – bringing together media art and design in new and unexpected ways. Andrew Burrell is a practice-based researcher and educator exploring virtual and digitally mediated environments as a site for the construction, experience and exploration of memory as narrative. Nori Beppu is a graphic designer specialising in print and digital media. He is as comfortable directing a major marketing campaign as he is designing interfaces for apps and other digital products. He is excited by the power of contemporary technology to create immersive and playful environments and brings his unique eye and skill set to the projects of ab:nb. Teetering somewhere between the performance art and queer club scenes, electro bowerbird Ladonna Rama produces campy techno and perverted pop.